RAW opening with a pre-titles backstage segment was a novel to start the show, with Triple H on terrific form as he congratulated Seth Rollins on his victory from the night before. Paul Heyman isn't from this world, I'm sure. His handling of the aftermath of his client passing out against The Undertaker at SummerSlam was Malcolm Tucker-esque, making good use of the convoluted finish to truly lay it on thick about The Deadman tapping out earlier in the match. The crowd lapped up every word and popped at the points ("G.F.Y") making this an event better watch at home. The sheer energy that the New Yorker had whilst announcing that Brock Lesnar wanted a rematch with Undertaker right there and then was truly something to behold. I popped so hard when Bo Dallas came out instead of The Undertaker, because I knew exactly what was going to happen (and if you didn't you haven't been paying enough attention). Dallas performed his role down to a tee, with his patronising inspirational character poking the proverbial bear, with the excitement building for what was clearly around the corner. The Inspirational Superstar bumped around for Lesnar taking a series of devasting looking German suplexes and it was glorious. Heyman begging Lesnar to deliver for punishment, with the crowd also very insistent, was a nice twist to what we've seen in the past with Heyman attempting to calm down the Beast. Could we see Dallas be Lesnar opponent for the upcoming live special at Madison Square Garden? Another act I'm getting a kick out of at the moment is Tag Team Champions, The New Day, so when Xavier Woods turned up with a trombone and the trio sang their version of Frank Sinatra's "New York, New York" I was in my absolute element. Big E and Kofi Kingston's match with The Lucha Dragons was hot from the start, with Kalisto looking impressive heading into the ad break. Whilst there was some more cool stuff in the bout post-break, the match didn't receive enough TV time to get too excited about, with Big E getting the pin in just over 6 minutes. The New Day may have been over with the Brooklyn crowd, but they couldn't compete for the affection of the crowd when The Dudley Boyz made their return to WWE, and proceeded to run through their greatest hits on the Tag Champs! A promo for John Cena granting his 500th wish for the Make a Wish Foundation, nothing but respect for the way WWE handled the video and Cena for his work with the foundation. Stephanie McMahon and Triple H hiding the statue from Seth Rollins was a cute little backstage segment, although them showing the statue here made it pretty clear that we wouldn't be seeing it later on tonight. Once again Bray Wyatt wore his funky hoody with horns on and once again we didn't get to fully see it, due to the lighting of his entrance. The first section of the bout Bray Wyatt and Luke Harper's SummerSlam rematch with Dean Ambrose and Roman Reigns was pretty similar to the opening of their match the night before, with plenty of quick paced action on the outside. After the break, I found the match much more enjoyable than their SummerSlam clash, with Ambrose revelling as the Lunatic Fringe in peril, whilst the other three also put in a shift in their respective roles. The near falls were done well, with Wyatt coming close off a ura-nage, whilst Reigns seemed to have the match done and dusted with a well-time Jackhammer. Perhaps the stand-out moment of the wrestling content was Harper and Wyatt attempt to mimmick The Shield's triple powerbomb move, which got a nice reaction out of the crowd. It was the finish that will be the talking point however, as SOME GUY arrived with a black sheep mask on and caused the disqualification that would give Ambrose and Reigns the win. However, it's not like Reigns and Ambrose had to time to celebrate, as the mystery man destroyed the pair with a funky submission hold, in one of the most impressive debuts in recent times. It was that impressive that WWE replayed the moment directly after the break. There were elements of Miz TV with Paige, Charlotte and Becky Lynch that I found really entertaining. I thought the three women did a sound job of getting their separate characters over in the interview, with The Miz acting as a good personality to bound things off. Team Bella also handled themselves well and the two teams back and forth on the microphone was particularly strong, with Becky and Alicia Fox's interaction standing out. However, the close of the segment with Team Bella awkwardly attacking PCB from behind, after the latter trio rounded on Miz, made them look a little bit stupid and the fact that the comments from their real rivals earlier on weren't enough to start a fight didn't make a whole lot of sense either. It was also disappointing not to see anyone reference the "We Want Sasha" chants, as it could have been a good opportunity for the Bella's to get some more heat. I have to admit that the section of this match that came before the commercial break (just over 5 minutes worth of action) struggled to hold my attention, with not a whole deal going on. It wasn't that the action was particularly bad or botch, just that there was very little that piqued my interest. However, Charlotte did stand out during her time in the match, putting together some pretty cool stuff with Nikki Bella towards the end of that initial five minutes, including the corkscrew plancha that lead the match into the break. The second portion of the bout, I was enjoying quite a lot actually, as Team Bella worked the legs of Charlotte, which, of course, meant that he ability to use the Figure Eight submission hold was diminished. Alicia Fox's stretch muffler submission was rather nice, with Charlotte selling well. Of course, this went straight over the head of the Brooklyn crowd who proceeded to do a Mexican Wave and chant "We are Awesome". Doing a Mexican Wave doesn't make you awesome, sit down and shut up, Brooklyn. Charlotte continuing to sell the leg by lying on the apron, after managing a hot tag to Paige, made me a very happy boy. It was surprising to see Alicia Fox pick up the win for her team with an Axe Kick, but with the Bella's back to their cheating ways, I thought that the finish offered even more potential for this feud going forward. The segment that Stardust turn on his partner King Barrett, before Neville proceed to batter Stardust didn't do a whole lot for me, but I suppose it's one of those things that will improve once a proper explanation is given. 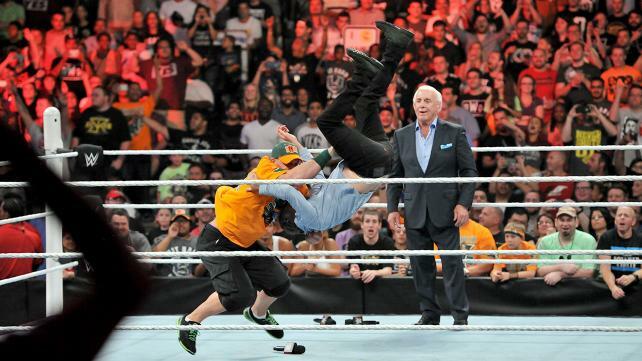 A segment involving John Cena, Jon Stewart and Ric Flair was next, and did exactly what it needed to do. We got a decent explanation to why Stewart got involved in Cena's SummerSlam match with Rollins, an appearance from Ric Flair and then John Cena got his revenge on the 52 year old former Daily Show host with an Attitude Adjustment. There were moments of charm as Cena delivered a decent promo about how stupid Stewart had been, but Ric Flair was simply there because he's Ric Flair, with the Nature Boy kind of just standing around once Cena hit the ring. It was surprising to see everyone in, what was technically the main event, eight man tag team match get an entrance to the ring, although it, at least, allowed the match to feel like a proper main event and gave the commentary team time to get over the various feud. There was a lot to enjoy in the home straight of the bout, whether that was Ziggler selling his knee after Sheamus kept his in stretch muffler variation (with "Are you not entertained?" addition), the cat-fight between Lana and Summer Rae that would lead to the hot tag, a surprisingly exciting collision between Ryback and Kevin Owens and a sizzling conclusion that saw everyone getting involved, this match turned into a great television main event. Sheamus falling to the pin, after a Big Show accidentally hit him with a Knockout Punch was an intriguing ending, but one that would continue to play out following the match. Big Show getting beaten down by everyone, firstly after a disagreement with Owens and Rusev (Owens: "I've loved you since I was thirteen years old") followed up the babyfaces getting in on the action was a bemusing segment, it almost seemed as if this was Big Show's last hurrah in WWE. A recap of The Undertaker and Brock Lesnar's bout from SummerSlam was shown for reasons. Seth Rollins, Triple H and Stephanie McMahon are three performers who clearly know their characters down to the ground, as they worked this angle, that saw all three of them trying to one up each other in how much they could put over one of the others. Both Triple H and Rollins had lengthy promos, with The Game explaining why Seth Rollins was now the man, whilst Rollins was focused on thanking the Authority for the opportunities that they had given. The whole build up to the reveal of the statue was quality television, with the trio making it clear in their performances that what was allegedly under the curtain wasn't actually there, making the audience stick around to find out what or who was standing there. That man was Sting and that pop was thunderous. As soon as the curtain raised and the painted face of the Vigilante was shown, the crowd went absolutely nuts and I'll admit to marking out like a little child also. Sting holding the WWE World Heavyweight Championship aloft, with The Authority looking on at the entrance ramp made for a interesting visual, as the commentary teams pushed an interview with Triple H on the WWE Network to follow. Is Sting in the WWE title picture in 2015 something that I particularly wanted to see, no. Did I care when watching this segment close RAW, not one iota. 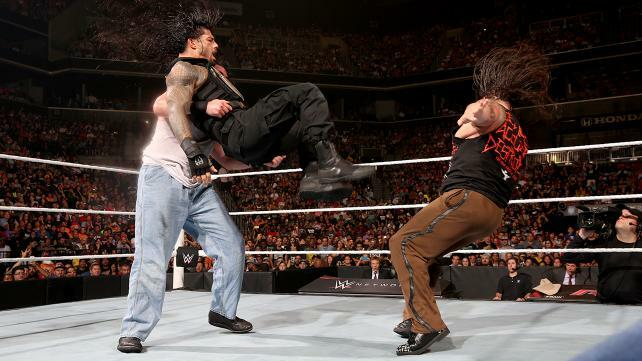 This Raw was akin to the style that WWE uses post-WrestleMania, with plenty of big surprises and a fresh debut. The Dudley Boyz, Sting and Braun Strowman's appearances all got a good reaction out of me. There might have only been four matches on the three hour show, but they were mostly lengthy tag team match bouts, that were enjoyable, despite the Brooklyn crowd turning on the Diva's Tag Team bout. For me, the main event was easily the match of the show. Whilst there wasn't a lot of in-ring content, the show was book-ended by two superb segments, the first with Brock Lesnar and Paul Heyman and the closer with The Authority that were both handled well both in terms of creative and performance. This show has given WWE some momentum heading into Night of Champions next month, with Sting vs. Seth Rollins already confirmed for the main event, it will be interesting to see how WWE builds on this over the coming weeks.